ECB Unveils Massive Bond-Buying Stimulus Program For Eurozone : The Two-Way The European Central Bank chief said the bank will buy 60 billion euros' worth of bonds each month until either September 2016 or inflation reaches about 2 percent. 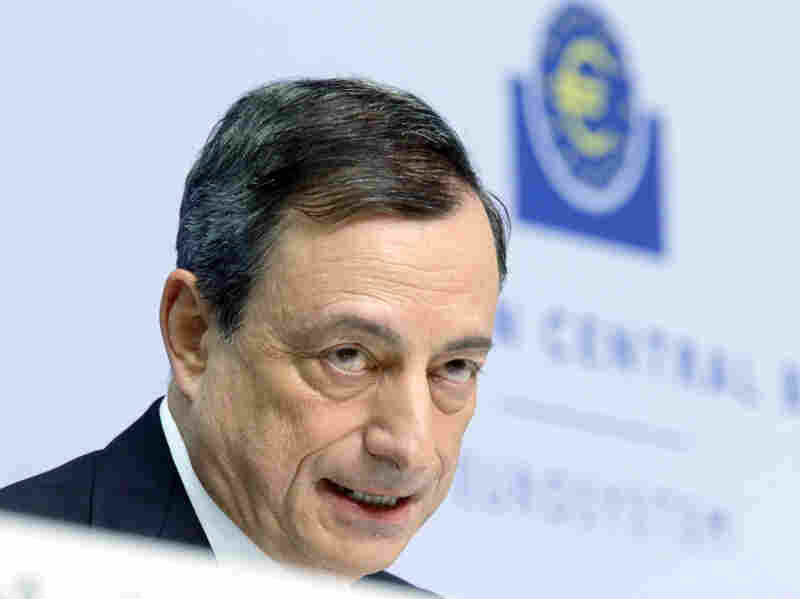 European Central Bank President Mario Draghi today unveiled in Frankfurt, Germany, a massive bond-buying stimulus program to kick-start the region's economy. The European Central Bank has unveiled a massive bond-buying stimulus program to kick-start the region's economy and battle deflation. "The combined monthly purchases of private and public sector securities will amount to 60 billion euros," ECB President Mario Draghi said today at a news conference in Frankfurt, Germany. He said the program will continue until September 2016 or until inflation reaches about 2 percent — effectively ensuring that at least 1 trillion euros ($1.16 trillion) will be injected into the eurozone economy. "The Fed's program is credited with helping boost U.S. growth following the great recession. Despite its success in the U.S., Europe has been slow to adopt it largely because of objections from Germany which shuns borrowing and fears inflation. But when the Eurozone fell into dangerous deflation in December, those objections were overcome." The ECB also announced that its governing council kept "the interest rate on the main refinancing operations and the interest rates on the marginal lending facility and the deposit facility ... unchanged at 0.05%, 0.30% and -0.20% respectively." -- "Among the reasons for the recent strengthening of the U.S. dollar and decline in the euro were market expectations the ECB would make such a move at the same time the U.S. Federal Reserve is preparing to start raising interest rates. A strong dollar can benefit U.S. consumers by lowering the price of imports and costs of traveling abroad. But it also can curb U.S. exports and corporate profits." -- "If the ECB's new bond-buying program works as intended, it should spur more economic activity there, which should mean more business for U.S companies and possibly more demand for U.S. workers." -- "On the other hand, if the ECB measures disappoint, the eurozone economy could remain sluggish or even contract, acting as a drag on global and U.S. growth for years to come."